It’s February. Not much in the way of options for preserving. 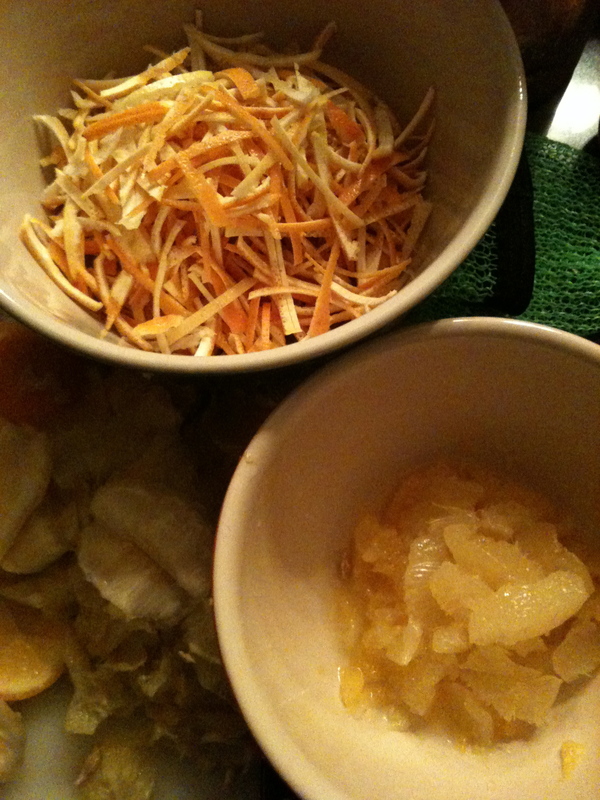 But it’s citrus season and marmalade production is in full swing! Get over your flu and get busy in the kitchen segmenting, de-pithing, and boiling up a storm. Alex, Laura and I wanted to do it right with Seville oranges, but we were two weeks early. Lucky for you that you now know in two weeks you can make the best marmalade in town! We used organic juicing oranges (Navel, I think) and Meyer lemons instead to make a sticky mess in the kitchen. Bernardin has great recipes for the patient, non-pectin varieties, but we only had a few hours, so we went the easy route. I highly encourage the use of organic fruit, as the peel is the best part of this bittersweet spread. And, of course, fair trade organic sugar is key, so that when you give the perfect little jars to your loved ones for their special occasions, you also give a gift of integrity, effort and critical thought. Yummy.